The Garden Isle is widely known for its rolling mountainscapes and lush jungle interior that attract adventurous travelers to its magnificent shores to soar in between the endless lofty rock faces and thundering waterfalls. However on the Northern coast of Kauai, there lies the impossibly huge and majestic Napali coastline, an unbroken formation of sheer cliffs towering over the Pacific Ocean that make for a truly awe-inspiring spectacle. One of the most exciting and impressive activities you can do on the whole island is embarking on a Napali Coast tour – either a half or full day activity that’ll see you speeding over the waves, silhouetted by the massive cliff formations with the chance to snorkel, explore lava tubes and learn about the Hawaiians that once made these imposing sea walls their home. Perfect for photographers, the Napali Coast is one of National Geographic’s favorite places to shoot and when the cliffs first come into view you’ll see why. With many available, it can be tricky to book the right Napali Coast tour depending on what you like to do, so we thought we’d do what we do best and fill you in on the best tours you can go on when it comes to Kauai’s unforgettable Napali Coast. Departing from Hanalei Bay on Kauai’s North Shore, you’ll be taken on a journey along the spectacular Napali Coast and regaled with stories about the Hawaiian explorers that settled there. As with the majority of tour operators, your safety is paramount, so dependent on weather and sea conditions, you’ll also get the opportunity to explore the extensive, breathtaking network of sea caves and lava tubes housed within the cliffs. This makes this Napali Coast tour perfect for groups or individuals who want the chance to get up close and personal with the cliffs and discover the foundations that the stunning island was formed on. For the thrill seekers amongst you, you’ll be pleased to know that your experience will be taking place aboard Adventurer II Rafts; fiberglass inflatable vessels that are designed for high speed to give a sense of adventure like no other as you cut through the waves under the towering cliffs. The tour also includes snacks and beverages to keep you going throughout the 4-hour duration of your coastal adventure. Owing to its quality and popularity, this tour is liable to fill up a few days in advance so be warned! To book now, please click here. This is the tour for those who want the full Kauai coastal experience and spend the entire day soaking in the fun and culture. 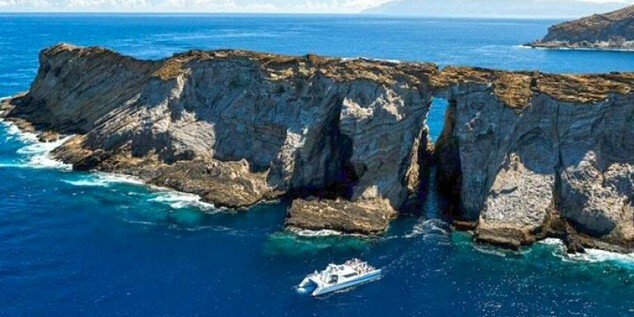 With only a modest hike in price in comparison to the other shorter tours, you’ll be treated to a 7-hour adventure not only including a thrilling boat ride past the Napali Coastline, but also the opportunity to visit the “Forbidden Island” of Ni’ihau and the Lehua Crater and Sea Caves. This is the only tour to offer access to all these sites whilst still including the journey past the famous cliffs, so if you want to see as much as this coast has to offer then this is the Napali Coast tour for you. After taking in the sights of the towering coastline, you’ll be taken to the island of Ni’ihau, off-limits to regular visitors and home to some of the clearest, most pristine waters of all the Hawaiian Islands due to the small amount of rain that falls there throughout the year. After snorkeling in these magical waters you’ll be treated to a delicious deli lunch. The food and refreshments offering on this tour is near unbeatable when you also take into account the continental breakfast you’re treated to in the morning and the free drinks (beer and wine) that’s on offer after taking a dip in Ni’ihau. If legendary sea craters, snorkeling in startlingly clear water with an abundance of marine life and marveling at a coastal wonder of the world sound like your kind of adventure, then don’t hesitate – book your tour now. 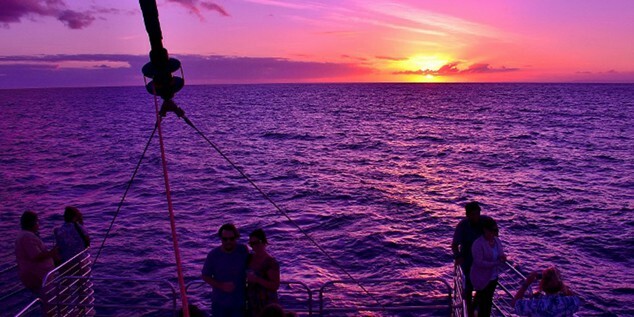 It wouldn’t be a coastal tour without the chance to see it awash in the gorgeous colors of a Hawaiian sunset. This Napali Coast Tour offers you the opportunity to do exactly that, from the comfort of a luxury vessel. Prepare for spectacular views, world class food and drink and an unforgettable trip. Clocking in at around 4 and a half hours, the cruise ferries you past the Napali coastline, letting you take in the sights at a leisurely pace and in a peaceful setting in comparison to the faster speedboats. With a champagne toast at sunset and a traditional Hawaiian dinner of Kalua pork and island fish, you’ll be hard pressed not to leave this Kauai tour with both a sense of wonder at the towering cliffs and a warm glow from the characteristically laidback Polynesian way of seeing them. As if that wasn’t enough, you’ll even have the chance to see whales in the winter! 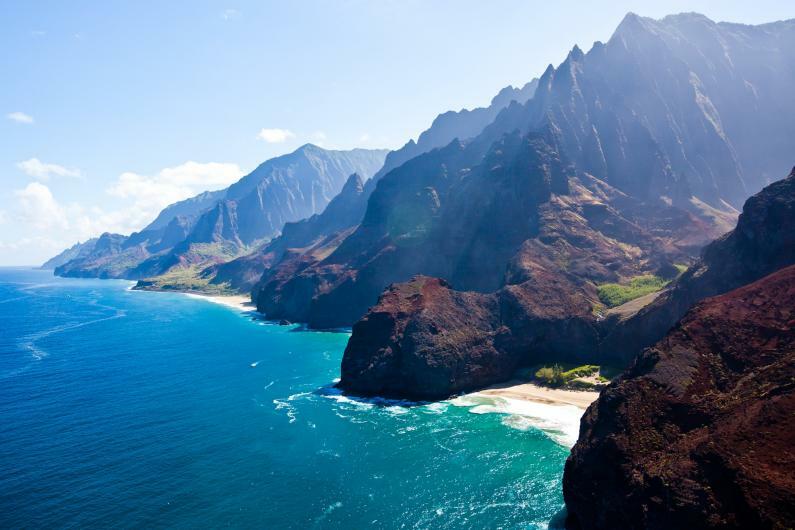 To book your place and experience a luxury Napali Coast tour, click here. If you’re after a sunset experience with a little more exploring thrown in than the dinner cruise then this is the Napali Coast tour for you. Coming in at a medium price range for this selection of tours, you’ll traverse the Napali cliffs, going past towering mountains and waterfalls that drop into the sea beside you with incredible photo opportunities along the entire route. The evening sunset makes the experience all the more magical, the beautiful orange rays silhouetting the majestic rock formations and turning the ocean gold. You’ll also have the chance to visit and explore the Kalalau beach and its valley, the ancient ancestral home to a vast number of Hawaiian settlers. This isn’t your typical dinner cruise, it’s more of an adventure cruise where you get the chance to take in the amazing sights as well as explore and enjoy dinner on the boat – so comfortable clothes are preferable! Over the course of this two hour journey you’ll have your fill of excellent food, gorgeous vistas and one memorable Hawaiian sunset. If you’d like to book your place you can go here. Maximum weight for passengers is 350 lbs. Our last tour is an experience that offers you all the wonders of the Napali Coast alongside yet another exclusive opportunity to explore an area restricted to most other visitors and vessels. Unlike the other excursions, this tour is also customizable and has a choice of departure time. Leave in the morning or afternoon depending on your disposition and choose how long you want to snorkel for to squeeze in fishing in Kekaha or Hanalei! After taking in the sights of the Napali Coast, you’ll make your way to Nualolo Kai, a protected reef that is positively teeming with exotic marine life and the snorkeling opportunity of a lifetime. With the operator providing all the necessary snorkeling gear and on hand for professional help, the offer really is hard to pass up. It’s got to be mentioned that this is in addition to exploring the Napali coastline in detail, with the opportunity to visit its network of magical sea caves dependent on conditions. This makes this Napali coast tour perfect for snorkeling enthusiasts who also want an in depth visit to the main attraction. Alongside refreshments and a delicious deli sandwich provided over the course of the day, the tour outdoes itself in the variety and quality of activities and service that can be expected. To find out more and book your place, please click here. Which Napali Tour is Right for You? So there you have it, if it wasn’t enough to simply visit the awe-inspiring coastline whose beauty has done everything from leave visitors speechless, to inspiring Hollywood directors to film there – you can now choose to do it in a way that floats your boat. Whether you want a Napali coast tour that’s back dropped by a Hawaiian sunset or you want to get a spot of snorkeling in, the tours we’ve picked are exemplary in their quality and their value for money. Like we said, finding the best tours the Hawaiian Islands have to offer is what we’re best at and after checking one of these out, you’ll see why. Want Hawaiian news delivered straight to your inbox? Subscribe to our Awesome Newsletter.